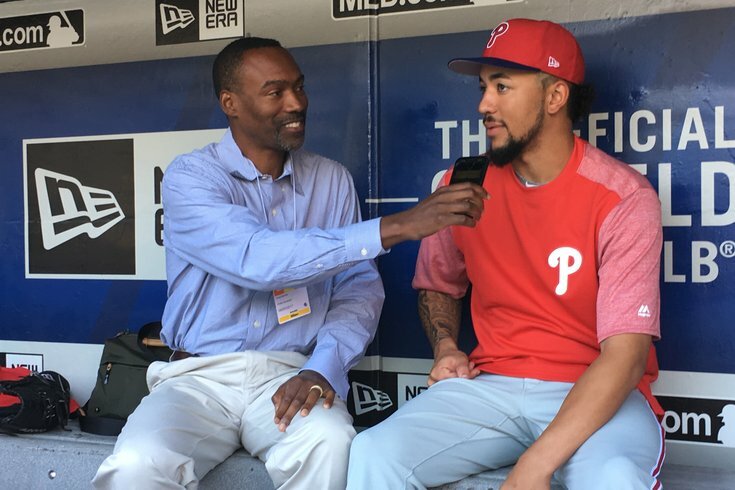 J.P. Crawford talks with former Phillies center fielder Doug Glanville before taking batting practice at Citi Field prior to his major league debut Tuesday. NEW YORK – J.P. Crawford will make his major league debut at Citi Field on Tuesday night. Less than 24 hours after news broke that he had earned a promotion to the big leagues for the first time – and skip out on the International League postseason he helped make happen – the 22-year-old Crawford is penciled into the Phillies lineup for the second game of their three-game series against the New York Mets. Crawford, a natural shortstop, will play third base and bat seventh in Pete Mackanin’s lineup. Interesting, Crawford is the third Phillies prospect to make his major league debut against Mets right-hander Jacob deGrom this season (Rhys Hoskins, Aug. 10; Nick Williams, June 30). Crawford had played every single one of his minor league games at shortstop until two weeks ago when he began getting reps at both third base and second base regularly at Triple-A Lehigh Valley. It’s likely he’ll get reps at both of those places – and at shortstop, too – in the three-plus weeks that remain on the Phillies 2017 schedule. According to Mackanin, the priority will be to play Crawford regularly. He's likely to play two or three straight games at third base and then a couple at second base. "I'm going to play him five or six times at short," Mackanin said of the remaining 24 games after Tuesday. So will he be in the lineup every day? "As much as I can," Mackanin said. "I don't want to say every day, but as much as I can." Mackanin also said it's possible Galvis, who had wanted to start all 162 games, could get a game or two off. As for Galvis, who has started all 137 games on the Phillies schedule this year (including one in center field last week)? Out of tonight’s lineup: Maikel Franco and Tommy Joseph, two players who have largely had subpar seasons and will enter spring training vying to keep their regular jobs (if they’re not traded this winter). Still, Franco and Joseph are likely to get somewhat regular reps this month in some form as Mackanin manipulates a crowded field of position players in the 24 remaining games following tonight’s in New York. Also out of the lineup: Aaron Altherr. The outfielder was in the midst of a breakout season before going on the disabled list, twice, with a hamstring strain. Altherr went on a rehab assignment last week but strangely did not play a game on said rehab assignment. He could be limited in September. The final three-plus weeks of the 2017 season are really no different than spring training for the Phillies. They're going to try to play as many players as possible – with an emphasis on seeing some of the new guys the big league coaching staff hasn't evaluated all season – in order to get the best look at everyone heading into the offseason. Who plays second, third, or shortstop on any given day in September is just a way to get a crowded group of players on the field for now. Come this winter, changes (trades) could be made. The regular lineup for 2018 remains uncertain, but if Crawford is able to adjust to the big leagues anywhere close to his former IronPigs teammate Rhys Hoskins, he'll force himself into a regular, consistent position in the 2018 lineup. "I’m here," said Crawford, who was issued uniform No.2. "I’m going to do the best I can do and hopefully get a spot for next year. Until then I’m just focused on today. I just want to focus on this game today and take it day by day."